Christmas always makes me nostalgic. I pull out all the ornaments we’ve collected over the years and I hang up the stockings my Mom lovingly cross stitched for everyone in our family. I set up my Grandmother’s nativity scene. We read some of the Christmas books I had as a child. 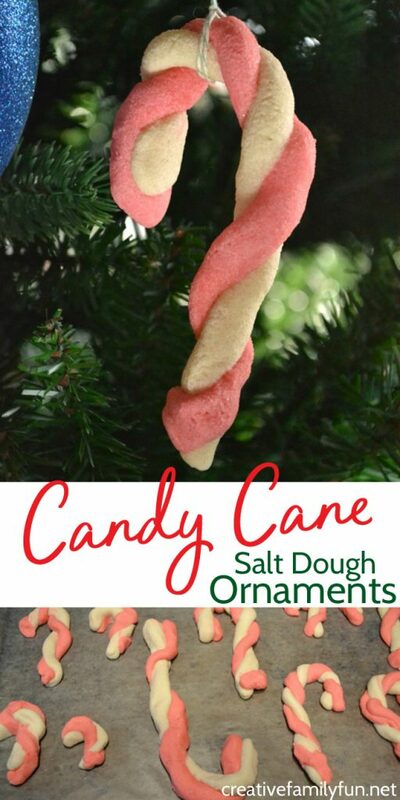 And, I always want to try and recreate some of the Christmas crafts I remembered doing as a child, like this Salt Dough Candy Cane Ornament. 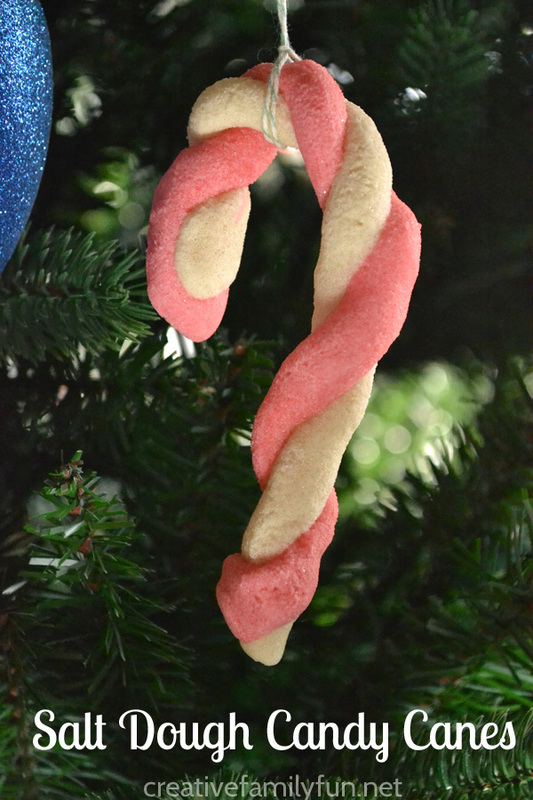 Did you ever make these Salt Dough Candy Cane Ornaments as a child? I know I did, or at least I think I did. It’s one of those crafts that have become so ingrained in my head that I feel like I’ve known about it forever. Since it’s just not Christmas without a salt dough project (or at least to me it’s not), I added this craft to our activity advent calendar. Now we’ve got a whole batch of these fun candy canes hanging on our tree. Have you ever made salt dough before? I just love working with it. It’s easy to make and easy to work with. Mix the salt and the flour together. Next add 1/2 cup of warm water. Mix until combined and a dough forms. The consistency should be similar to play dough. 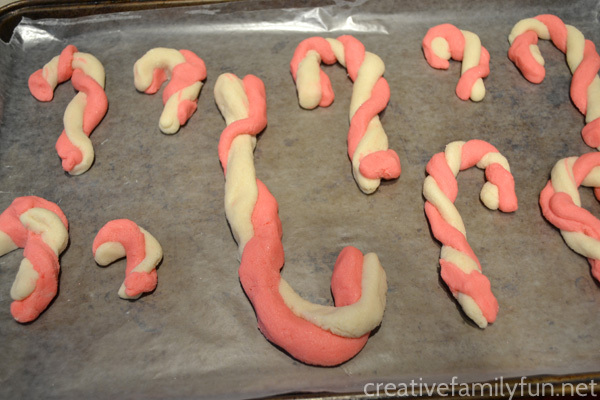 For the candy canes, divide the dough into two equal parts. Add red food coloring (or red liquid watercolor) to one half of the dough and knead it in until it is as red as you want it to be. I used liquid water colors for ours. Keep the other half natural. 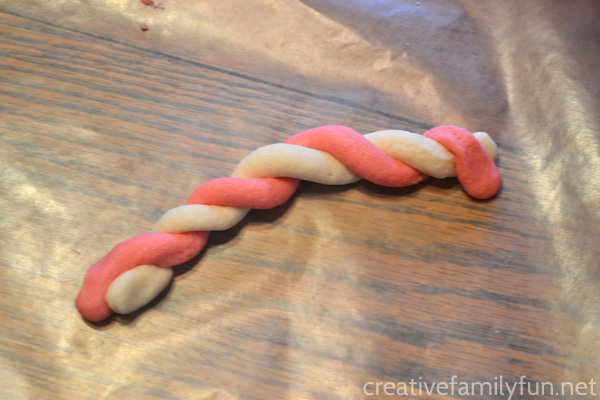 We were able to make 10 salt dough candy canes with one batch of dough. 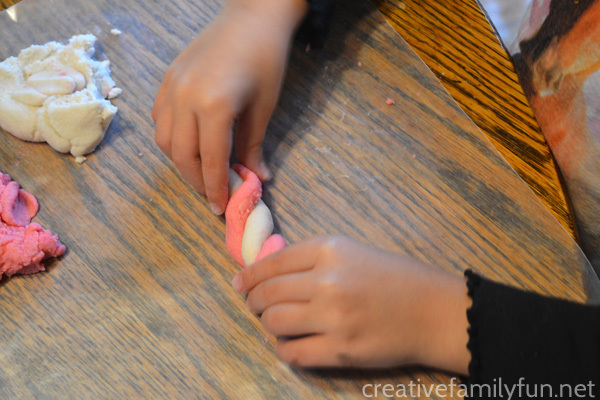 To make our candy canes, we took a small chunk of white and a small chunk of red dough. The girls rolled each one out until they made equal-sized snakes. A word of caution: we discovered that if we made our snakes too skinny, they broke when we tried to twist them together. After they had rolled out their dough, they twisted the two colors together. We pressed the ends together just a bit so they would stay together. Then, we took the twist and curled one side into a hook. We had our candy canes! As you can see, we had all shapes and sized of candy canes. Some average size, some short, and one really big one. I added them all to a parchment-lined baking sheet and put them in a 250 degree F oven. It’s hard to predict exactly how long they need to be in the oven, so check them after one hour. Continue to check until your candy canes are hard. Ours took about 2 hours. The thickness of the candy canes, the amount you make, and your type of oven all factor into the amount of time it takes to harden. I always recommend to check them on a regular basis. Once our candy canes had cooled off, I tied some twine around them so the girls could hang them on the tree. It was an afternoon filled with Christmas nostalgia. 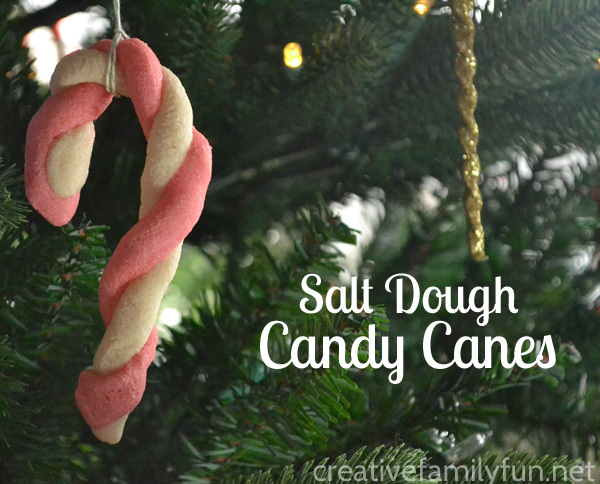 Even though I was mostly an observer, I’ve still got those candy canes hanging on my tree to remind me of all the fun I had with the girls while making the Salt Dough Candy Cane Ornament of my childhood.